A foliate kelp crab found at low tide. Photo by Sara Wickham. This spider crab's carapace is slightly wider than it is long and roughly maple leaf-shaped. The carapace teeth along the sides are flattened into overlapping winglike extensions. The rostrum is short and divided in two. The pincers are thick but not particularly large, and the first pair of walking legs is significantly longer than the others. 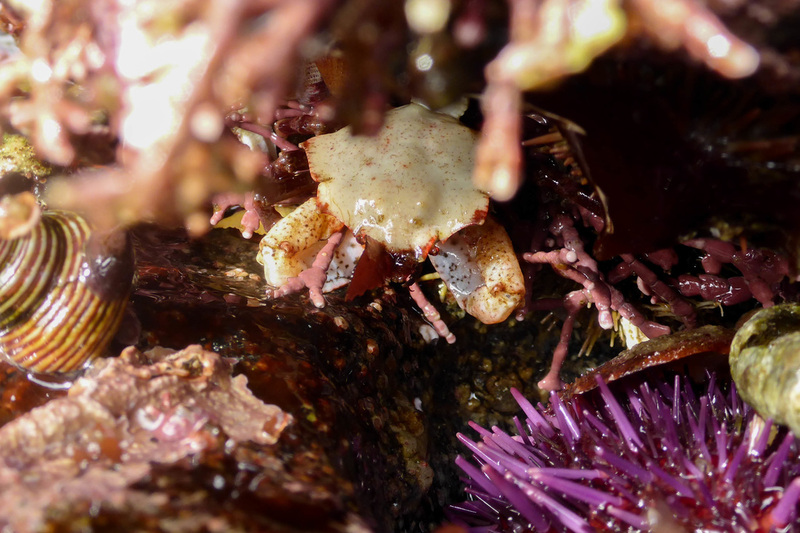 The foliate kelp crab's colour is highly variable, ranging between white, yellow, brown, orange, pink, and red. It may also be patterned with a combination of colours, and there is often a wide white V-shape in the middle of the carapace. The legs, claws, and carapace may be different colours or patterns. This species only decorates its carapace a little, if at all, but it may occasionally be encrusted with organisms such as bryozoans and algae. The width of the carapace gets to just over 4 cm. The foliate kelp crab is a cryptic species, often hiding in and around holfasts and other cover provided by kelp and sessile invertebrates. It attaches to its surroundings using its back legs while catching and eating drifting pieces of kelp. It inhabits the lower intertidal and subtidal to 128 m deep, but is mostly found in the shallow subtidal. It can be found on and near open coastlines from northern Alaska to southern California. The carapaces of similar spider crab species, such as the northern kelp crab (Pugettia producta) and the graceful kelp crab (P. gracilis), are not wider than they are long, and lack the slightly overlapping lateral teeth. Additionally, the former has much more pointed carapace teeth, and the latter has distinctive blue and orange-tipped pincers. Hart, J. Mimulus foliatus Stimpson, 1890.In Klinkenberg, Brian. (Ed.) E-Fauna BC: Electronic Atlas of the Fauna of British Columbia. Lab for Advanced Spatial Analysis, Department of Geography, University of British Columbia, Vancouver. Accessed ​27/06/2016. Jensen, G.C. (1995). Pacific Coast Crabs and Shrimp. Monterey, CA: Sea Challengers. P. 26. Watanabe, J. (2016). Mimulus foliatus Stimpson, 1860. SeaNet: Common Marine Organisms of Monterey Bay, California. Stanford University, Stanford, CA. Accessed 27/06/2016.